There are few things more annoying than trying to cut a pizza fresh out of the oven when you just don’t have the right tools. Basically, you hack the pizza apart, lose half the toppings, and no one gets the same size. 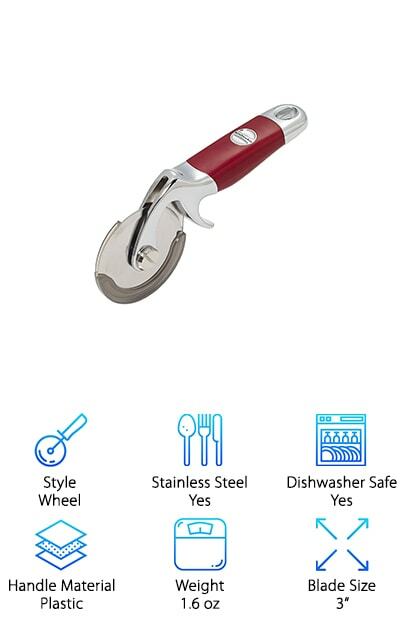 But, the best pizza cutters can save you from this nightmare. Before we get to the pizza cutters we researched, let’s take a look at some of the important features you need to know before you shop. Style: Unless you order a custom pizza cutter, there are generally 2 kinds: rockers and wheels. We’ve got a little bit of everything on this list, including one that just blows this rule completely out of the water. Stainless Steel: Stainless steel is the perfect material for a pizza cutter. 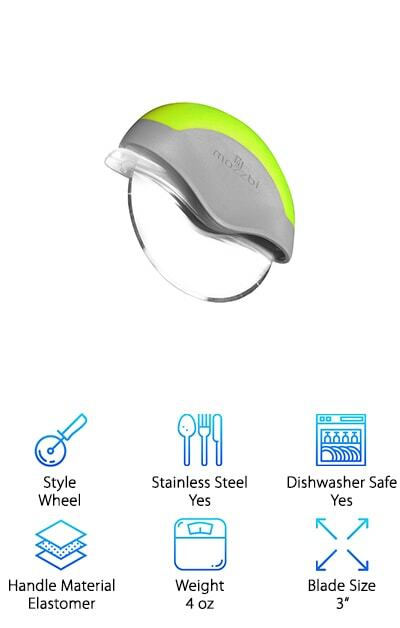 It’s sharp, doesn’t rust, is dishwasher safe, and it’s a really popular material in kitchens now. Maybe that’s why our top picks all use it as their main component. 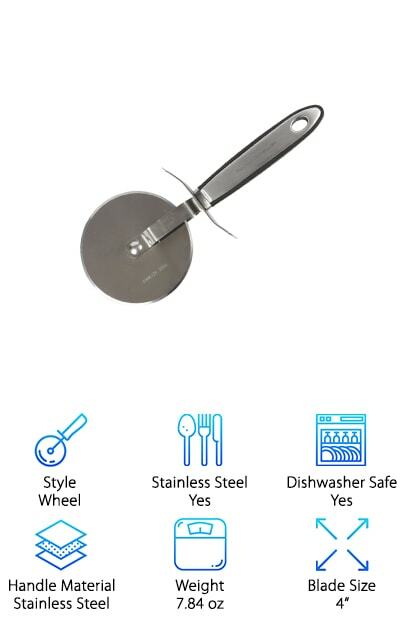 Dishwasher Safe: Having a pizza cutter that you can pop in the dishwasher makes cleanup a breeze. Think about it: there’s going to be sauce and melty cheese and toppings all over it. Clean-up should be as easy as possible. Handle Material: You’ll see 3 different varieties here. One: stainless steel. Two: rubber grip. Three: stainless steel with a rubber grip. The handle should be comfortable and have a thumb/finger guard. Having a hole to hang it from is a bonus. Weight: Obviously, if you’re going to be using this tool to cut pizza, you don’t want it to be too heavy. Make sure it’s light enough that you can easily control it and heavy enough that it’s effective. Blade Size: For pizza cutters with wheels, they usually range in size from about 2 to 4 inches. Larger blades will stay sharp longer but smaller blades are usually safer because they’re a little easier to control. For rocker style cutters, this spec will tell you how big the blade part of the cutter is. Now that you know more about what to look for in an awesome pizza cutter, let’s get right to our best pizza cutter reviews. Don’t waste time and money searching for a Wusthof pizza cutter! Check out our top and budget picks first, especially if you’re running short on time. They’ll give you a good idea of the kinds of products out there. Then, keep reading to learn about the rest of our amazing picks. Ready? Okay! Let’s get to it! The best pizza cutter is this rocker blade style cutter from Checkered Chef. It’s one of the easiest tools we’ve ever used in a kitchen. It’s designed for maximum results with minimal effort. This is a rocker style cutter that’s dishwasher safe so it’s not only easy to use, it’s also really convenient. One thing we really like about it is the protective sheath. This is a really sharp tool and having a protective sheath not only helps keep the blade intact, it also makes storage really easy and helps prevent injury. There’s no “handle” on this one - it’s actually made from one continuous piece of stainless steel. Why is that a good thing? There are no cracks or crevices for any bacteria to hide! The best pizza cutter for the money is our budget pick from ZYLISS. 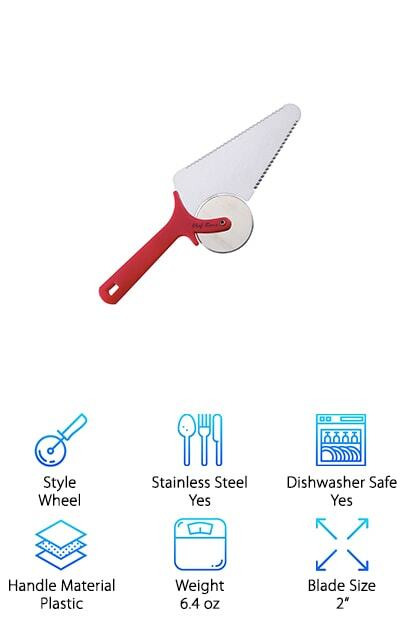 This is a really simple design that consists of a stainless steel wheel blade about 4 inches in diameter with a bright red, plastic handle. The handle is ergonomically designed so it’s comfortable to use. It’s also easy to control so that you can get uniform slices every time. This one is great for left- or right-handed users and fits comfortably into any hand. It’s efficient, effective, and convenient thanks to the easy clean-up. Get this: the blade can easily be removed from the handle and placed in the dishwasher. This is a great tool to use to cut pizza, waffles, baked goods, and more. Plus, it’s designed to last a long time and even comes with a 5-year limited warranty. This wheel-style cutter from YingHe looks exactly what comes to mind when you think of a classic pizza cutter. That said, this one probably looks a lot sleeker than what you’re imagining. This pizza cutter is shiny stainless steel from the end of the handle to the tip of the blade. And speaking of the blade, it’s 2.5 inches in diameter, large enough to be efficient but small enough that it’s easy to control. That’s not all. The handle is brushed so you can get a better grip. Plus, there’s also a thumb and finger guard for extra safety. As far as cleaning, since it’s made from stainless steel, it will never rust. You can easily wash it with hot, soapy water or put it in the dishwasher if you prefer! This rocker style pizza cutter from KoBzA is a little unique because the blade is on the smaller side at only 6.5 inches wide. You won’t be able to take it across a whole pizza in one rocking motion like some of the longer blades, but there’s a really great trade off in that it makes this one a lot more versatile. What do we mean? The size is perfect for other things, too, like chopping vegetables or salads because it’s smaller and a little easier to control. The rubber handle is soft, comfy, and gives you a really good grip. Plus, it comes with a protective guard that you put on the blade when you’re not using it so you can store it without worrying about damaging it or hurting yourself. Whether you’re looking for an 8, 12, or 10 slice pizza cutter, you should know that the right one can handle any size pizza. This KitchenAid Pizza wheel is an excellent choice. Chances are you’re familiar with the KitchenAid brand. They make everything from prep tools to cool kitchen gadgets to baking supplies. This durable, sharp pizza wheel is a great product from an experienced brand. 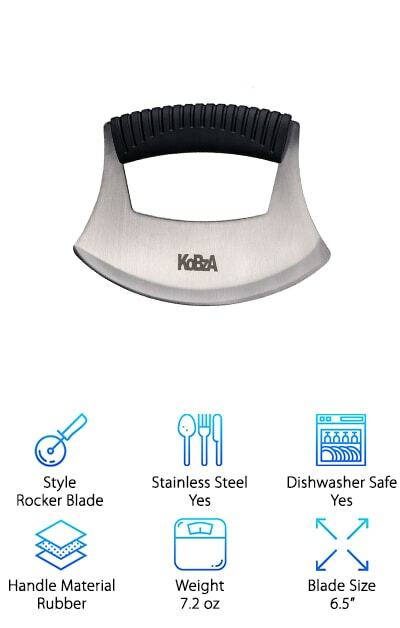 The stainless steel blade comes with a blade protector so it can be stored without worrying about damaging it or accidentally hurting yourself. The dark red plastic handle gives a little bit of grip and the finger guards make sure your hand doesn’t slip while it’s in use. Plus, cleanup is a snap - just place it in the dishwasher and you’re ready to go for next time. Precision Kitchenware gives you a nice, big 4 inch circular blade that can easily take on even the largest pizzas. The stainless steel blade is really sharp and can cut through any kind of pizza, no matter thick the crust. The handle is ergonomically designed with a soft black rubber grip around the rim so your hand won’t slip as you’re rolling the blade along. Plus, there’s a thumb and finger guard to keep your hand safe from the blade in case you do lose your grip. The handle has a hoop so you can hang it for easy storage, too. And get this. It comes with a lifetime guarantee. That’s right. If you ever have any issues with this pizza cutter, you can get a new one or a full refund. This is the most unique product on our list, hands down. Why do we say that? There’s a lot to this pizza cutter from Chef Remi. It’s actually a 3-in-1 tool. First, it’s a wheel style pizza cutter with a sharp, stainless steel blade that rolls over your pizza and cuts it into perfect slices. Having trouble getting through that thick crust around the edges? No problem, it also has a serrated knife blade so you can finish cutting through anything the wheel wasn’t able to get. Sick of picking up a piece of pizza only to have all the cheese and toppings slide off? Use the triangular pizza server to serve it without worrying about everything sliding off. This cutter has the best of everything, including a 100% money back lifetime warranty. 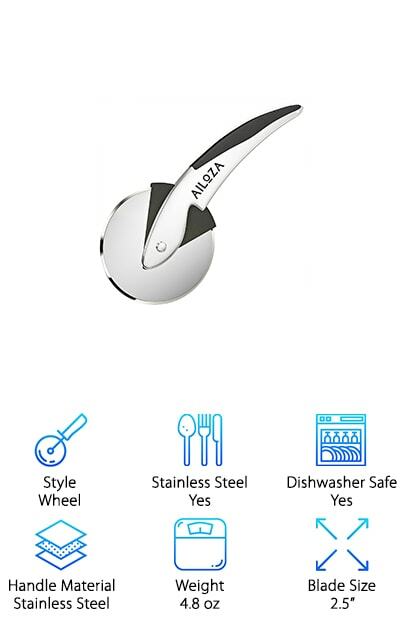 The Ailoza Pizza Cutter Wheel is a high-quality pizza cutter with a simple, sleek design that you’re going to love. The handle is ergonomically designed for ease of control and comfort. 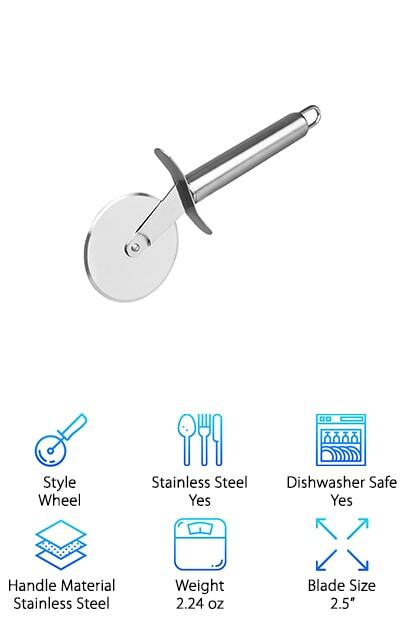 It has a long handle so you’ll be able to push the wheel smoothly and quickly, getting the perfect pizza slice every time. There are black rubberized grips on the handle, too, so you don’t have to worry about slipping. There’s even a special place for you to put your finger and thumb to get an even more effective grip and help to prevent any injuries. Cleanup is easy, too, just wash it in hot, soapy water and towel dry or just pop it in the dishwasher when you’re cleaning up and let it take care or the rest. Mozzbi has a wonderful wheel-style pizza cutter that comes with a generous 3-inch blade. It fits right in the palm of your hand thanks to the custom thermoplastic elastomer handle. 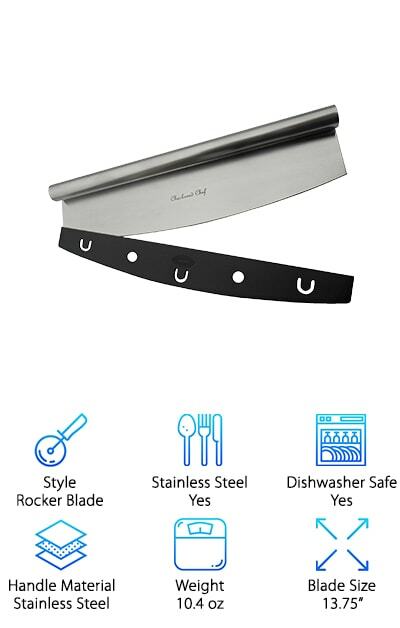 The blade sits inside the handle, which acts as a protective shield as you push the blade through your pizza, cheese, cake, or anything else that needs cutting in your kitchen. You might think that cleaning would be difficult with a style like this because so much of the blade hides in the handle and is difficult to reach. Never fear! This cutter easily comes apart so you can clean every last bit of it. This cutter comes with a 30 day money-back guarantee and a 1 year warranty. What do you have to lose? And besides, your pizza is waiting. 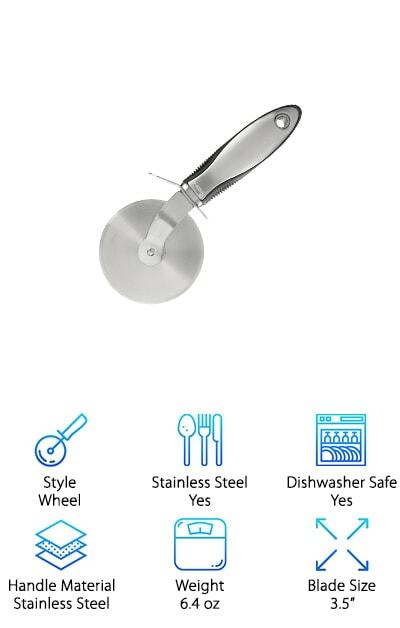 The OXO Pizza Cutter Wheel has a large 3.5 inch blade that will easily slice through any pizza, pie, or even pastry dough. The blade is made of stainless steel. The handle is, too, though it does have some black rubber around the rim of the handle for added grip and texture. The grip provides excellent slip resistance for when you’re pushing the wheel through your pizza. There’s also a thumb guard just in case you have an accident. If you have stainless steel appliances or accents in your kitchen, this pizza cutter is a great compliment. The shiny stainless finish and the black accents of the grip give it a clean, modern look. The handle even has a hole in the end where you can hang it when it’s not in use.